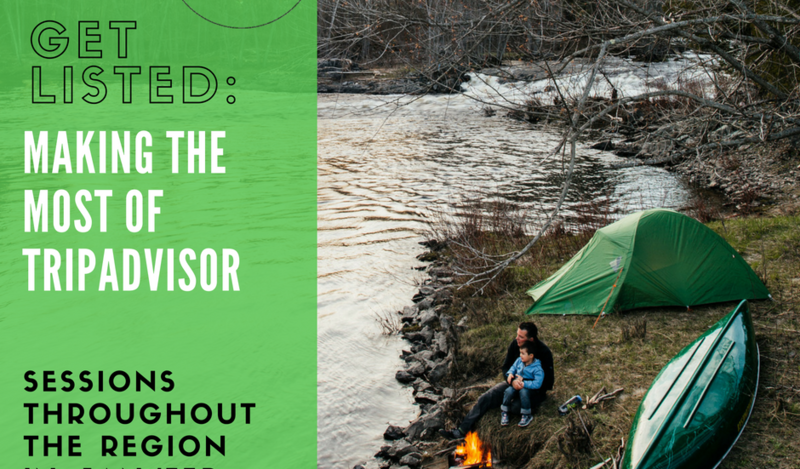 Now that your business is listed on TripAdvisor, you may think you can simply sit back and watch the reviews come pouring in – and your ranking to soar! Unfortunately, this approach will not ensure you are luring in new customers or capturing all your potential reviews. Here are five simple TripAdvisor tips to keep your listing fresh, relevant and engaging to viewers, and get the quality reviews you deserve. Just like the changing of the seasons, change up your description to include new promotions, packages or products/services that your business offers. Consider sharing ideas of activities or tips for potential guests to enjoy when they visit your business in the coming months. Depending on your business and how far out your plan your offerings, you could also include insights into what guests could expect in the coming year. 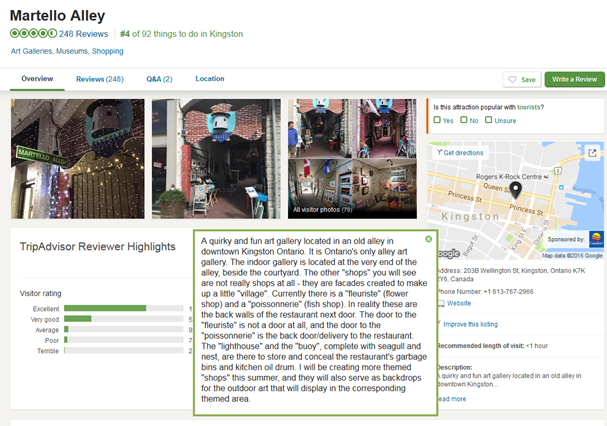 Martello Alley in Kingston gives its visitors a sneak peek via their TripAdvisor listing. 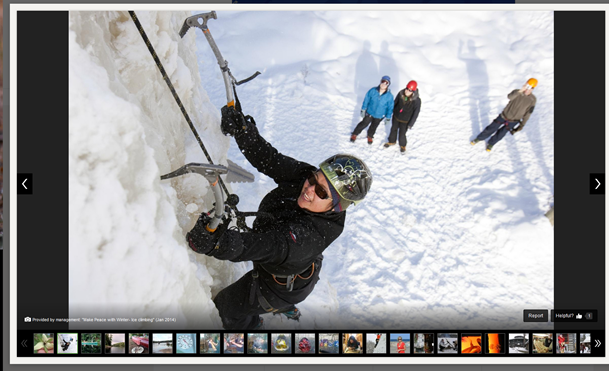 While customers can share their own photo your listing, you can also add photos that showcase the various elements of your business. Get creative and think of images that capture the experience(s) you offer rather than the typical staged and “stock” photo. Using engaging photos can lure a viewer into imaging what it would be like to visit your business and the kind of experience they could have. Another focus could be on your customer service and showcasing your staff as they interact with customers. Photo provided by management at Yours Outdoors located in Haliburton, ON. Online customer service is becoming increasingly important to businesses and how an owner/manager handles the responses is critical. Yes, the online world runs 24/7 and leaving a negative review hanging for a few days can do more harm than good, but Replying to positive reviews is just as beneficial. Try to respond to all reviews within one to two business days. If it is a negative review, be sure to step away and take the time to think about your response before you post it. In many cases, customers are looking for acknowledgment and to know that the business has heard and understood their concerns. 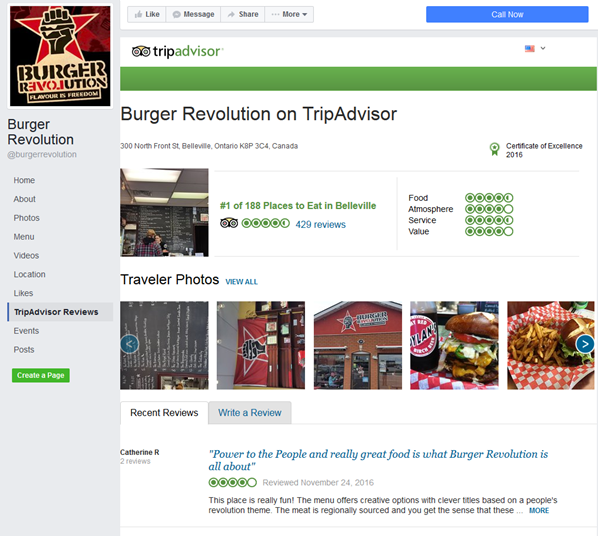 Burger Revolution links its TripAdvisor Reviews to its Facebook Page. Make sure that your listing is accessible through your social media accounts with a direct link to your page. This will increase your appeal to prospective customers as word of mouth marketing is the best form of marketing available now. Allowing people to see first-hand from others who have experienced your offerings builds trust before they walk through your doors. It also sets the level of expectation that a new customer can establish in advance. Bonus: you can use your social media accounts to push for reviews from current and old customers – the more the merrier! 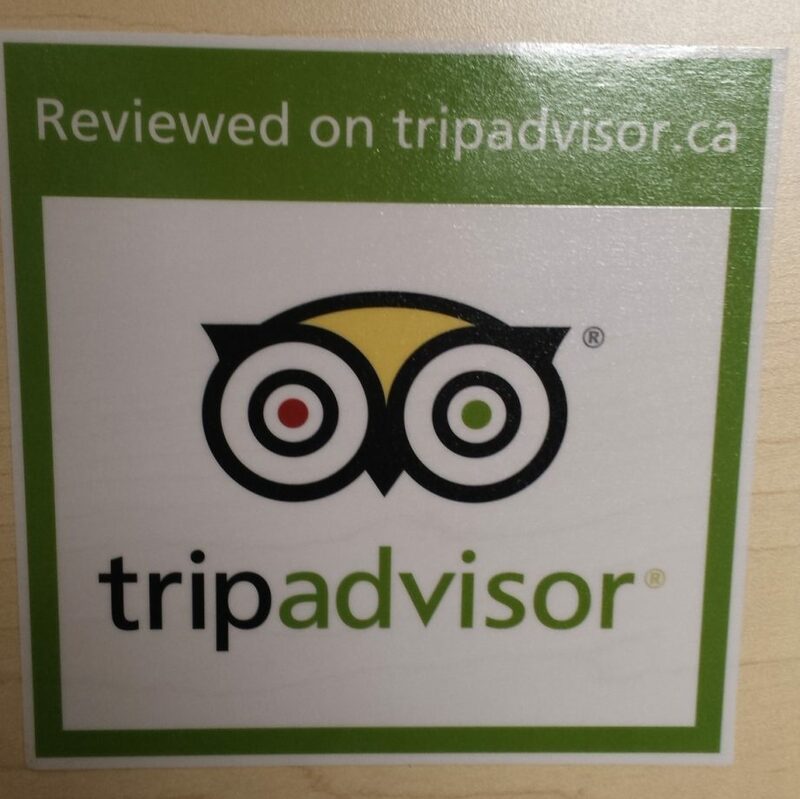 TripAdvisor stickers are available to order. TripAdvisor has many marketing options available for businesses to use in promoting their listing and gain reviews from customers. Through the website, for example, you can request a free TripAdvisor sticker that you can display in your window or front door. The company also make exceptions for individual requests to use their logos on your own print and promotional materials. You can get self-service widgets through their website, such as their Badges (i.e. Featured, Rated or Recommended on TripAdvisor) that update daily to showcase your rating and review count. There is also a Facebook App that you can link to your Page that allows you to share your ratings and reviews with your fans. TripAdvisor is one of the best free online marketing tools available for the hospitality industry, so why not take advantage of this tool? Once your listing is up, try to implement one or two (or all if you’re ambitious) of these extra steps and ask customers about whether they’ve seen your page on TripAdvisor. Easy-peasy, right? This is the second email from the TripAdvisor series, click here to read the first one, “Why Should Your Business Be Listed on TripAdvisor” and be sure to sign-up for emails from Bay of Quinte Regional Marketing Board to get the third and final blog post, “3 Ways To Encourage Reviews On Your TripAdvisor Listing.” Interested in a hands-on workshop to get your listing up and active? Sign-up for one of the upcoming workshops being held across the Bay of Quinte region and Hastings County.